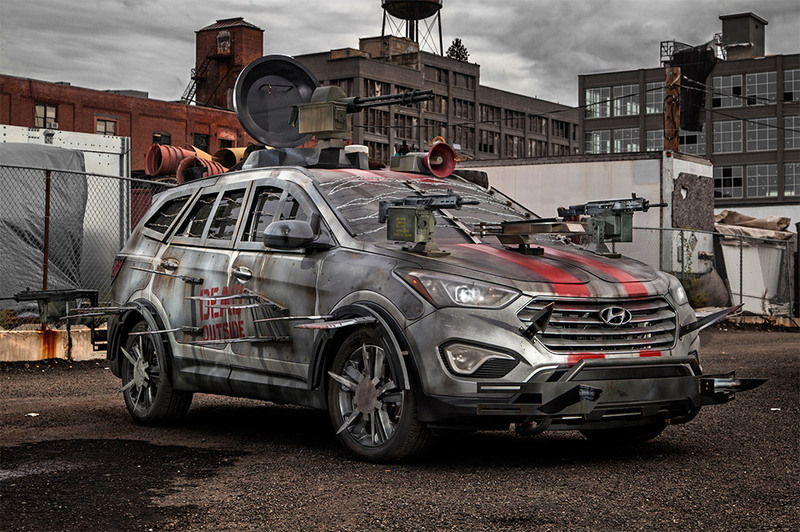 The Hyundai Santa Fe Zombie Survival Machine debuting at the 2013 New York Comic-Con show features knife blades, an automatic crossbow and razor-wire windows. The Santa Fe Zombie Survival Machine was a designed by Anson Kuo on The Walking Dead Chop Shop configurator. The winning design was chosen from more than 82,500 fan submissions, Hyundai said. Other details on the Hyundai Santa Fe ZSM include three machine guns, a samurai sword, aluminum armor and a muffler silencer. "His mission was to create a stealthy vehicle with abundant cargo space for supplies and passengers, maximizing survivability against the undead," said Hyundai in a statement. The winning vehicle was built by Galpin Auto Sports. It joins the Hyundai Elantra Coupe and the Hyundai Veloster in the Korean automaker's zombie-fighting lineup. Hyundai isn't the only automaker to use zombies as a marketing tool. Ford has used the creatures to tout the features of the Ford Fiesta against the competition.